The United States Congress designated the Sandwich Range Wilderness (map) in 1984 and it now has a total of 35,303 acres. 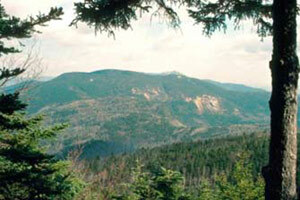 All of this wilderness is located in New Hampshire and is managed by the Forest Service. Located in the southeastern corner of the White Mountains, the bold peaks and long ridgelines of the Sandwich Range form a rugged series of valleys, glacial cirques, and high mountain passes. The terrain is broken by steep, boulder-strewn streams tumbling over cascades and through calm pools. Dense spruce-fir vegetation dominates at upper elevations, with northern hardwoods on the lower slopes and valley bottoms. Flat Mountain and Black Mountain Ponds attract moose and other pond-loving wildlife, while peregrine falcons nest on the steep cliff face of Square Ledge. Several hiking trails access the range, and approximately 57 miles of these typically steep and direct routes are within the Wilderness itself. Many of these trails date to the turn of the century (the last century!) and provide visitors a direct connection to the long recreation history of the area. Planning to Visit the Sandwich Range Wilderness? How to follow the seven standard Leave No Trace principles differs in different parts of the country (desert vs. Rocky Mountains). Click on any of the principles listed below to learn more about how they apply in the Sandwich Range Wilderness.